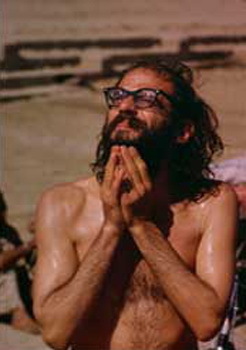 In 1961 Allen Ginsberg left New York by boat for Bombay, India. He brought with him his troubled lover, Peter Orlovsky, and a plan to meet up with poets Gary Snyder and Joanne Kyger. He left behind not only fellow Beats Jack Kerouac, Gregory Corso, and William Burroughs, but also the relentless notoriety that followed his publication of "Howl", the epic work that branded him the voice of a generation. Drawing from extensive research in India, undiscovered letters, journals, and memoirs, acclaimed biographer Deborah Baker has woven a many layered literary mystery out of Ginsberg's odyssey. 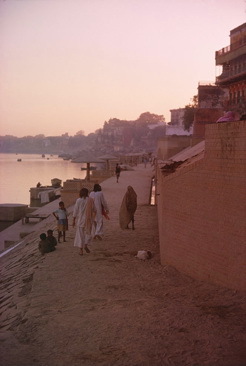 A Blue Hand follows him and his companions as they travel from the ashrams of the Himalayan foothills to Delhi opium dens and the burning pyres of Benares. They encounter an India of charlatans and saints, a country of spectacular beauty and spiritual promise and of devastating poverty and political unease. In Calcutta, Ginsberg discovers a circle of hungry young writers whose outrageousness and genius are uncannily reminiscent of his own past. Finally, Ginsberg searches for Hope Savage, the mysterious and beautiful girl whose path, before she disappeared, had crossed his own in Greenwich Village, San Francisco, and Paris. In their restless, comic and oftimes tortured search for meaning, the Beats looked to India for answers while India looked to the West. 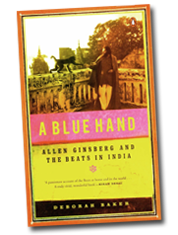 A Blue Hand is the story of their search for God, for love, and for peace in the shadow of the atomic bomb. It is also a story of India — it's gods and its poets, its politics and its place in the American imagination.